Atheists are having a ball! 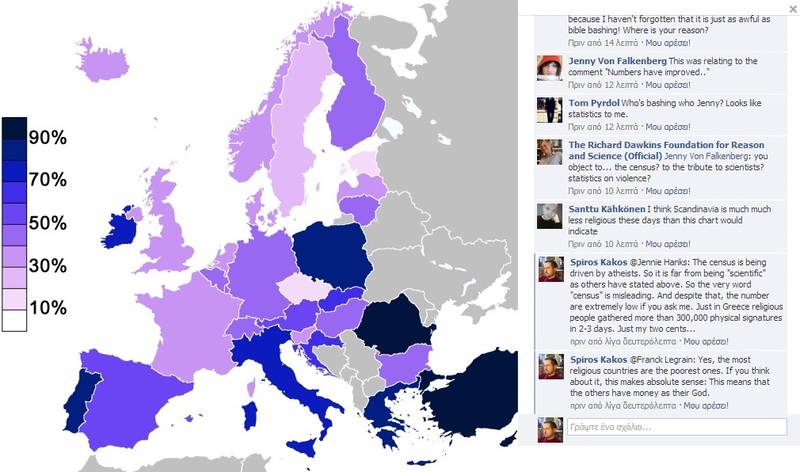 The Dawkins Foundation is leading a worldwide census so as to determine the numbers of atheists around the world. 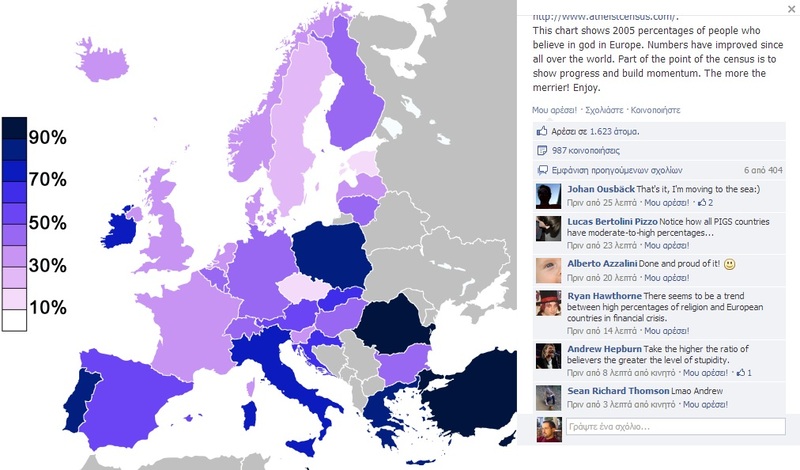 The caption of the picture says more than the picture: “This chart shows 2005 percentages of people who believe in god in Europe. Numbers have improved since all over the world. Part of the point of the census is to show progress and build momentum. The more the merrier! Enjoy“. Be an atheist - It is in fashion! I have news for you atheists: No one is “at war”! Nothing is “improved” if a percentage of believers or non-believers is increased! The world is One! The world is about Love. The hippies have said it, but someone else said it too long ago. Maybe so long ago that we have forgotten it. We should stop being so much over-consumed by our will to conquer our enemies and learn that traits like forgiveness and love is what separates us from the animals. A fake “census” on the Internet will not show the way to “victory” (and this applies to religious people as well). The tables have turned and atheism, along with money, is the new trend. And trends come and go. Atheists should be really careful not to become the “bad” type of religion which has turned so many people away from God. And I am happy to have comments. Would very much like to talk more about philosophy with people like you, who have arguments for their beliefs. Concerning money: You are more than right that during our time on this planet, we worshiped money for too long. Yes, it is not a phenomenon of today. However I believe today this phenomenon has increased in intensity. And I hope we agree that this is a bad thing overall. Concerning Dawkins and the first paragraph of your answer (I will answer to the others after that): I did not present anything dishonestly. Those organizing and advertizing this census are dishonest in presenting something not scientific in a way that can be misleading. This is my point. When you read about a Census you are usually not going to the small notes at the end of the page to see if it “scientific” or not. The post at Facebook is characteristic. It even presents – along with the hyperlink for the census – a map with percentages of population. 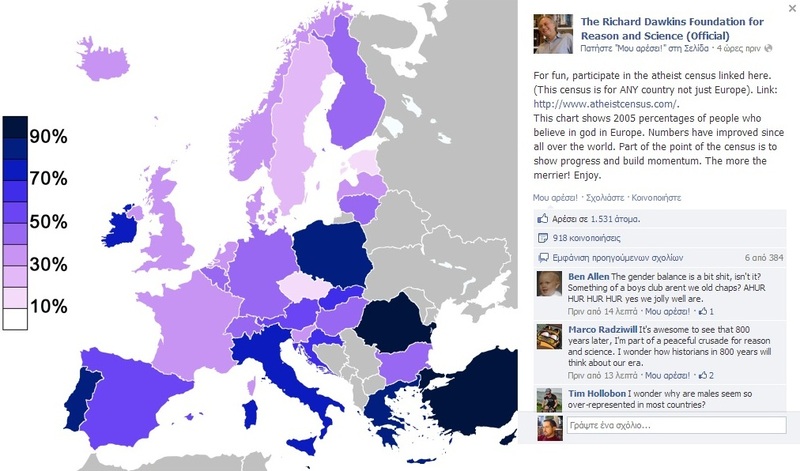 And many people commenting on that post (made by Dawkins Foundation of Facebook as you can see) did not get it at all and thought that the census was related to the map. Being honest is simple: do not put unrelated things side by side, do not use a word which usually implies a scientific method without explicitly telling people that your census is an exception to the rule. Please try to explain me. I have started explaining how believing in a universe being created by accident and from nothing is more irrational than the belief in a First Cause, and I am 299 posts and counting… Moreover, I did not say anyone is evil, if you paid attention to what I wrote. I just said the obvious. How can a census be conducted in such a way? PS. And do you really think that money (and more money and even more money) is not the God of modern “civilization”? I would really like that explained too. Oblige me. First, let’s return to the census. The AAI doesn’t claim this to be a scientific census. It doesn’t even offer theism as an option. Their objective is to “… build a picture of the world’s atheists.” Your being misleading by telling people otherwise. The suppression of atheists throughout history, has caused many who would otherwise be atheists to remain in obscurity. Dawkins’ goal is to communicate that it’s ok for atheists to be honest with themselves and those around them. This census is simply a tool to help show that atheists are everywhere; and for those that are hesitant, they can find atheists in their own country, etc. Furthermore, I’m sure you’re aware that Dawkins has sponsored scientific polls in the past that were conducted by reputable, independent agencies. By presenting this census in the manner you did, you’re trying to discredit Dawkins in a disingenuous way. Also, your main contention seems to be on the use of the word census; meaning your argument is semantical. If it’s more than semantics, you’re merely upset that atheists want to spread their views. This is likely because atheist’s harbor views that are diametric to your own. Yet, I doubt you’re upset that theist’s proselytize their views door to door. So, your position above would be hypocritical. Now, since you have written nearly 300 posts on what I would presume to be the various philosophical arguments for and against gods, I assume you’re familiar with the rebuttal to the cosmological argument. My position is simple: You have established nothing by asserting that there must have been a First Cause because it’s logically contradictory. To assert that (1) everything has a first cause and (2) God is an exception to this rule is contradictory. Because if EVERYTHING has a first cause, then logically God must as well. I’m aware that your response will be something like, “God is transcendent and eternal”, but that’s merely an assertion. As this argument is strictly a priori (which is another problem in itself), you don’t have any demonstrable evidence that God is ACTUALLY transcendent and eternal. That said, we have demonstrable evidence for the possibility of a universe that commenced from nothing. As you seem to be acquainted with this subject, I’ll refrain from going in depth, but a zero-energy flat universe is supported by a quantum fluctuation spurred by the uncertainty principle. Is this what happened? Maybe; but it’s important to differentiate between our arguments: mine is demonstrably supported by empirical evidence. Meaning, even if it’s not the “answer”, we have evidence that indicates the universe CAN occur naturally. Let’s move to your final position. In order for your argument about money to be factual, you would have to present an era where humans didn’t aspire to attain money; money being, resources. If you embark to argue that we hold resources in higher regard today than in the past, you would have to quantify that somehow; and I think you will have a problem doing so. By logical induction, we can assume that resources have always been desired; but neither of us can quantify that desire. That’s a terse explanation of my position. Have a great day, and I’m sorry if my original comment came off as hostile or ad hominem.